I think a lot of the recent rise in prices is due to the anticipated tax reduction for corporations. A lot of companies in the USA will benefit greatly. Altria for example has been running up a lot since they pay 36% tax rate right now. Any reduction to the 20s% will help greatly improve share buybacks, EPS, and other financial metrics. For those that have seen my previous summaries, the portfolio weightings are largely unchanged. I am targetting stable companies that are not cyclical. I prefer stable growth to explosive growth. 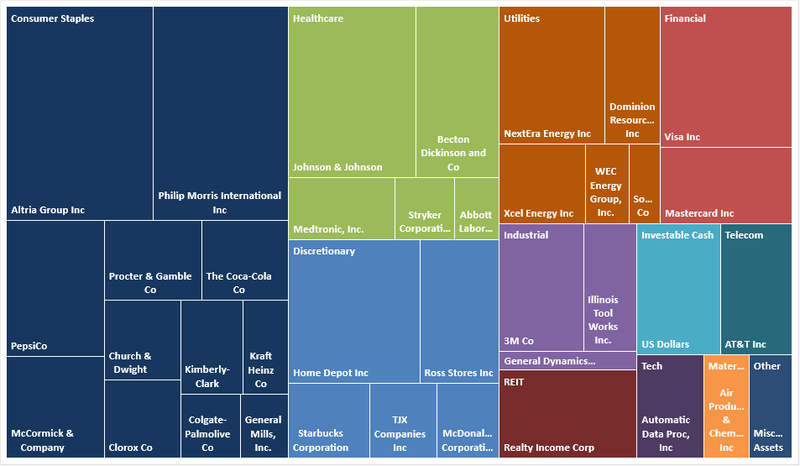 A lot of these companies that fit this profile are consumer staples, healthcare, and utility stocks. My cash position is around $13k right now. I will consider purchasing some more stock in the coming weeks. My portfolio net value was flat previously for several weeks as the consumer staples was underperforming. The trend has completely reversed recently and I am now largely over my 2017 goals. 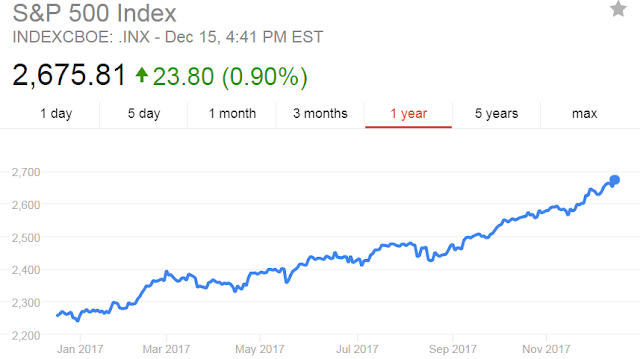 I was originally planning for $400,000 this year but my portfolio is sitting near $430,000 and I believe I can pass $430k before the year ends. I am taking this time to travel for 2 weeks and enjoy the overshooting of my goals. The recent growth in my portfolio from 400k to 430k shows how money by itself is able to do a lot of heavy lifting by itself. A 7.5% percent climb is not much but if one's investment base is large it is noticeable. 7.5% of $100k is only $7,500 but 7.5% of $1MM is $75,000. I eventually want my money pool to be so large that my money can start working for me in noticeable ways. The recent growth also shows how one must be in the market and not sell out when one is experiencing bad weeks. I was adding to consumer staples companies when that sector was weak (dollar cost averaging), sticking to my philosophy and buying better yields. Studies have shown that the market's best returns in a year are often only in a very handful of days. If one misses those few special days, one will have bad performance compared to the index. This is why I am fully invested all the time, good times and bad. It is impossible for me to know if that special day is tomorrow or next Monday. Price is one thing, dividends to me are more important. Price is to me ephemeral. It can change one day and another day depending on the prices people want to pay. It is up to the whim of people and their emotions. Not something I want to bet my investment philosophy on. Dividends however are less prone to random fluctuations. They are dependent on the business's fundamentals. As long as the companies I hold continue to earn more and grow, the dividends will also grow or at least continue to be maintained. I will in turn use those dividends to reinvest in more companies or pay for my living expenses. 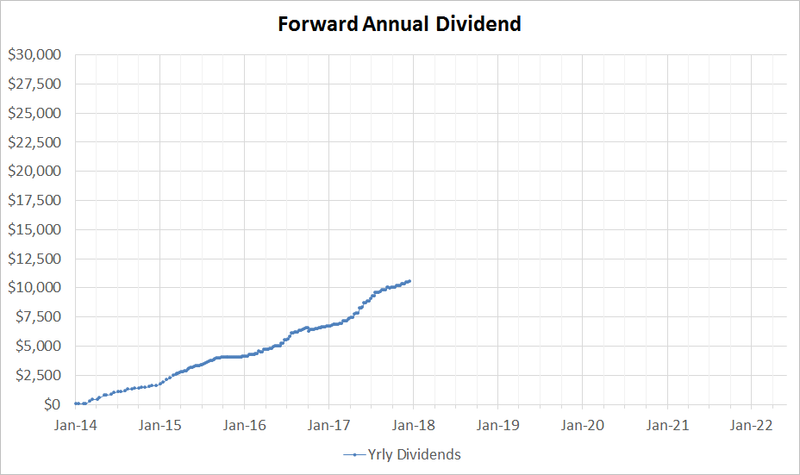 My forward annual dividends is slow and steady. The growth is like clockwork. Every share I buy adds a drop into the big bucket of annual dividends. Right now around 8 out of 12 of the months in the year, I am able to receive ~$1000 in dividends which is not so bad. This money can be used for living expenses or pleasure or buying more investments. Amazing results. The one sentence I love is how it is evident that your portfolio can do the heavy lifting for you. Now that your portfolio is sizable, the emotional swings of Mr. Market will have a larger impact. Yes, you have seen a large run-up in companies that pay high tax rates and are starting a large tax cut down. It'll be interesting to see what the final bill looks like and if it eventually passes. IF so, I am expecting a lot of dividend increases and share buybacks when more cash becomes available. 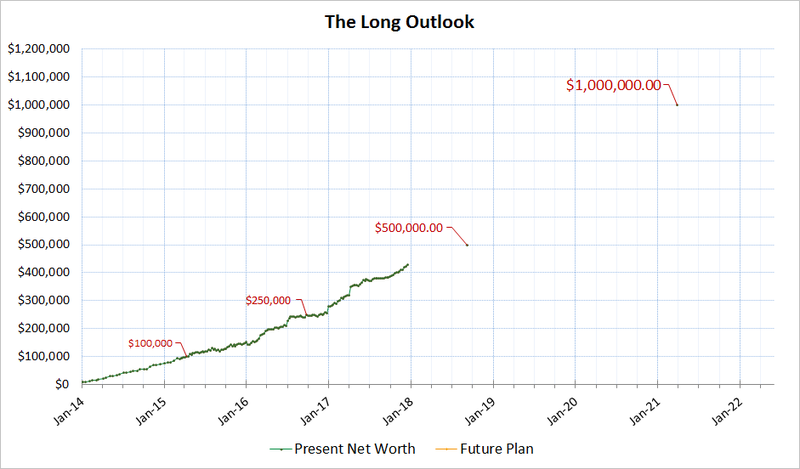 Congratulations on moving past your 2017 goal of $400k -- I like your long outlook chart and it looks like your well on your way to that $1M mark! Nice portfolio and I like that you track S&P credit ratings. I do the same and normally don't buy any stock below a BBB rating. I would like to have access to Value Line score but it is quite expensive. If you are in the US, check your local city's library. It's free. I have a library card from mine and have access to their Value Line's research using my library card number.